At the end of the second world war, Simone de Beauvoir and Jean-Paul Sartre launched the “existentialist offensive,” an ambitious campaign to shape a new cultural and political landscape. The word ‘existentialism’ was a popular neologism with no clear meaning. They wanted to profit from its media currency by making their philosophy its definition. Sartre’s talk “Existentialism is a Humanism” was an instant legend. The venue was packed, the crowd spilling into the street. Furniture got broken. People fainted and were carried outside. Sartre had to push his way through to the podium, where he delivered a speech entirely off the cuff. Unsurprisingly, in the circumstances, it was rather sketchy and occasionally inconsistent. Beauvoir’s altogether more coherent account was published a few weeks later as “Existentialism and Popular Wisdom” in the third issue of Les Temps Modernes, the cultural and political journal the pair had founded. These were the keynotes of their rich programme of talks, articles, plays, and novels, which firmly established the fifth and sixth arrondisements of Paris as the centre of European intellectual innovation. An extensive secondary literature about existentialism soon sprang up. Books about existentialist fiction focused on Fyodor Dostoyevsky, Franz Kafka, Albert Camus, and Jean-Paul Sartre, sometimes adding Samuel Beckett or Herman Hesse. Books about existentialist philosophy focused on Søren Kierkegaard, Friedrich Nietzsche, Martin Heidegger, and Jean-Paul Sartre, with some including Karl Jaspers and Gabriel Marcel. And thus, as if by magic, one of the two original existentialists had disappeared from view. Sartre’s writings had made it into both parts of this newly created canon, but Beauvoir’s were in neither. Why did this happen? What exactly is the difference between her and the men whose works were identified as paradigmatic of existentialism? This really is quite mysterious. Most of those included did not describe themselves as existentialists. Pretty much all of them either died before the word was coined or explicitly denied that it was a fair description of their work. Indeed, the only one of these men to explicitly label their own work as existentialism was Sartre, who did so alongside Beauvoir, both defining the term by their shared philosophy. This awkward fact was ignored in the burgeoning secondary literature, often with the dubious thought that a true existentialist might reject the label anyway. The equally awkward fact that the thinkers and works newly classified as existentialist hold nothing at all in common was also ruled unimportant in the secondary literature, usually by the simple expedient of declaring existentialism a “family resemblance” category. This debate about Beauvoir’s relation to existentialism has been entirely generated by trying to understand existentialism without reference to her philosophy in the first place. Exactly how is Beauvoir supposed to be related to this family? She has been read as a descendant who merely dramatised and drew ethical implications from Sartre’s philosophy. Conversely, she has been read as an unacknowledged ancestor of Sartre’s existentialism. And she has been read as outside the family entirely, due to the deep disagreements between her conception of human agency and Sartre’s. Her writings of the existentialist offensive, on this reading, were simply designed to promote his career. This debate about Beauvoir’s relation to existentialism has been entirely generated by trying to understand existentialism without reference to her philosophy in the first place. If we try now to add her to the established canon of existentialist writers, we can only caricature her by emphasising too strongly the features she shares with members of that canon. For her philosophy at the time of the existentialist offensive was built around two distinctive features not shared with them. One of these is her theory of sedimentation. Beauvoir argued that our values and outlook become gradually more embedded in our cognition the longer we endorse them, making it difficult to fully reject them later. This directly contradicts Sartre’s view, often considered crucial to existentialism, that we have the ‘radical freedom’ to simply abandon any of our values or ideas. The other is her argument that it is morally imperative to respect and promote human autonomy. Existentialism is often thought to reject any idea of an objectively binding or universal morality, yet Beauvoir’s most recent book at the time of the existentialist offensive, Pyrrhus et Cinéas, was an extended argument for exactly this. To make the disappearing existentialist herself reappear, we need to rethink existentialism. We need to return to the works of the existentialist offensive and the texts they summarise, treat the shared philosophy of those texts as definitive of existentialism, and treat their disagreements as theoretical disputes within existentialism. We should then categorise other writers as existentialist only to extent that they agree with this core definition, allowing their works to expand on these definitive texts and contribute to resolving the disagreements between them. This will not only set the historical record straight. It will also set the philosophical record playing at the right speed, allowing us at last to hear it properly. Featured Image: “Jean Paul Sartre and Simone De Beauvoir welcomed” by Avraham Shlonsky and Leah Goldberg at Lod airport. Image courtesy of Israel Government Press Office. CC-BY-SA-3.0 via Wikimedia Commons. 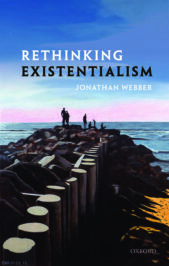 Jonathan Webber is Professor of Philosophy at Cardiff University and the author of Rethinking Existentialism.